River Perry to Rednal (restoration) ( section2a ). South of the Perry Aqueduct. 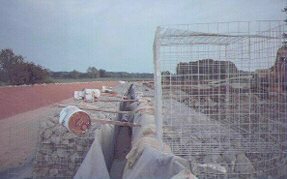 Gabion baskets were used in a double row to build a new bank where the ground had previously been weak and unstable. The same area after restoration. 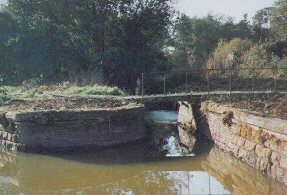 The towpath bank with the canal in water, showing the effect of the gabion constructed banking. 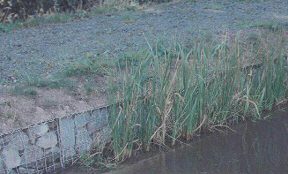 Hollow blocks filled with soil and planted with reeds just below the waterline were used to some effect, as seen in the photo. 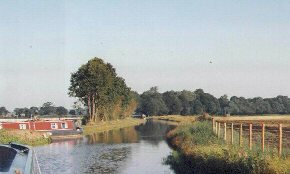 View towards the Perry Aqueduct. 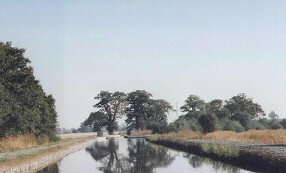 Taken from a southerly direction, showing the slowly maturing canal in water. As seen approaching from the same direction as the above photo. Near to Woodhouse Estate was the site of an old drawbridge. Woodhouse was the home of the Rev.John Robert Lloyd, one of the original members of the Ellesmere Canal commitee.It was near to this point that he had the canal diverted to pass "Woodhouse", an unauthorised diversion which was built but subsequently restored to the original authorised route. The route that it still follows. 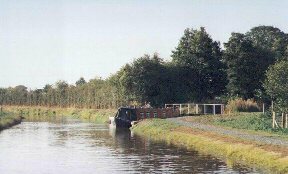 The canal passes cornfields on its approach to the Boneworks Arm. Entrance to the Bone-works Arm. Showing the old tow-path swing bridge. 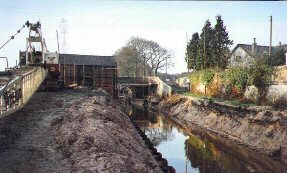 The water level was low during canal bed re-profiling and bank works. Boat moored in the entrance to the Boneworks Arm. 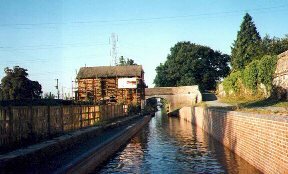 Photo taken after the canal was re-watered. The swing bridge that you can see in the background is in remarkably good working order although a bit stif. The arm and pool where there used to be piers for mooring boats have been dredged and are now a wildlife area with no access for boats. 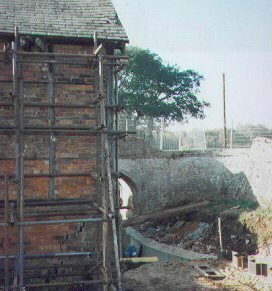 A further view past the Bone Works Arm . Note the new fencing on the off-side bank. 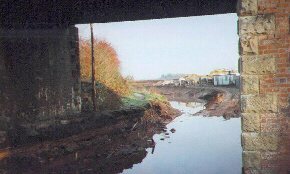 Looking towards Frankton from under the railway bridge at Rednal before the restoration work was completed. The contractors compound is seen on the off-side bank. Note the amount of water in the channel--this was a constant problem whilst work was in progress. 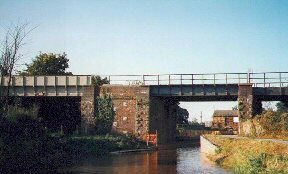 The two arches of the Shrewsbury to Chester railway line straddle the canal at Rednal. The Heath Houses canal passenger terminal can be seen through the right hand arch. 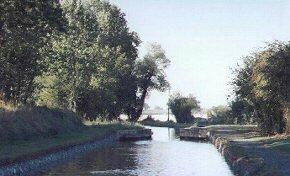 This photo was taken when the canal was once more open to boats. Work proceeds by the old packet station at Heath Houses, Rednal. A crane that you can just see part of (red) was used to install the heavy duty piling that had to be used to stabilise the banking. 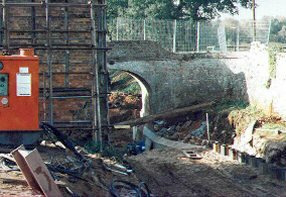 The canal bed was cast in concrete and the piling was also also capped and back-filled with concrete. A further view of the work at Rednal. Heath Houses Bridge can be seen past the packet station. Cracks in the wall were a cause for concern but the scaffolding frame that you can see around the building held it together as the surrounding work was completed. Heath Houses Bridge and Passenger Terminal Building. 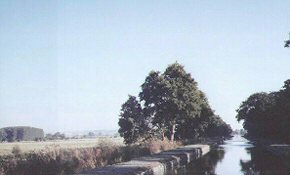 The piling work had been completed before the canal re-filled itself with water. The crane to the left of the photo was the one used to install the pilings. 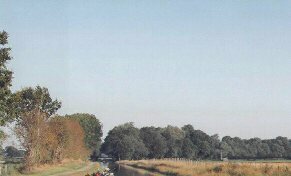 Taken after the canal had been re-opened to boats. Note the new brick walls built on top of the pilings ,carrying the towpath.